Old Trafford, Manchester - Manchester United Blog: City drop below the curve. A couple of weeks ago we laid out our predictions for the run in. The graph above shows the actual performances of United and City versus our predictions for each team. 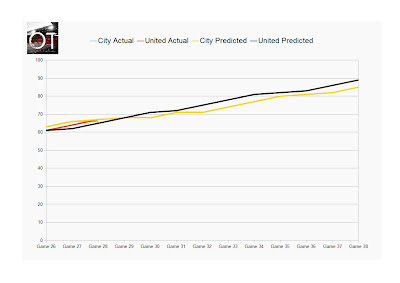 As we see from the graph United are ahead of the curve courtesy of their win at Spurs. Today however City were beaten at Swansea while we had predicted a draw for that fixture. It was a result that leaves United two points better off than we predicted while City are a point worse off. Come on you reds!!!!! !